We've talked a lot about candidacy for hair transplant surgery in the past, and we've talked about how effective it is for many patients. We have noticed a number of younger men who are losing their hair contact the practice to learn more about hair transplantation. What surprises these people is that there's an issue with age that needs to be taken into account. When you visit our hair loss clinic, we'll be sure to discuss these matters with you in full detail. Right now, let's just go over the basics of how age affects suitability for hair restoration surgery. Is age an important factor when it comes to hair loss surgery? Yes, it is. Generally it's a bad idea for men in their 20s and early 30s to undergo hair restoration surgery. Hair loss can be somewhat unpredictable. With men in their 20s and early 30s, they may continue to lose hair through their late 30s and into their 40s. This means that there may not be a reliable donor area yet, and hair restoration experts generally want to work conservatively when it comes to identifying a donor site and creating results that look natural and last. Are there exceptions to these age concerns? There may be some exceptions to these age concerns, but they are rare. If you're that concerned about hair loss, we recommend talking about this issue with your general practitioner as well as hair loss experts in your area. Note that you will likely find consensus among a lot of experts regarding age and hair transplant surgery. How young is too young for hair restoration surgery? While it varies from patient to patient, people in their 20s are definitely too young for follicular unit transplantation and other kinds of hair loss surgery. The early 30s is also too young for most patients, though it's important to consult with surgeons about these matters. As patients get into their later 30s and early 40s, they generally become better candidates for hair transplantation, though this depends on the progression of their hair loss. What alternatives do relatively young people have for hair restoration? If you are in your 20s and early 30s and are experiencing hair loss, we often feel that the best treatment is non-surgical. 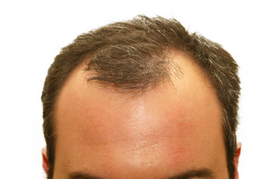 This means the use of Rogaine (minoxidil) or Propecia (finasteride). These are the most effective non-surgical options for slowing and/or reversing hair loss. There are plenty of factors to consider when it comes to hair loss, and your personal situation will define the best treatment option for you. As we mentioned above, it's a good idea to discuss these matters with your physician as well as hair loss experts in your area so that you can get a good understanding of all your treatment options. By weighing all of the pros and cons, you can make an empowered choice about treating hair loss. If you would like to learn more about hair transplant surgery and your many alternatives for addressing hair loss and male pattern baldness, contact our hair restoration clinics today. With locations in Manhattan, Boston, New Jersey, and Long Island, our experts will be ready to help you make the best decisions about hair regrowth and restoration.